I decided to get the December box because the colors were so pretty! I am usually "classic with a twist" but I opted for the "American Beauty" box because of the purple polish. For swatches, contents of the box and promo code for your first box keep reading! The box included a foot scrub, 2 polishes and a diy cabochon ring with a peppermint candy! I haven't tested this out yet on my feet but I am sure it's a great product like the others. I am waiting for Christmas to try it because I think I am getting one of those foot soak massage buckets and would like to use it then! Can't wait! The black base with glitters is Patti and it reminds me a lot of Metallics 4 life by opi but a bit more subtle. 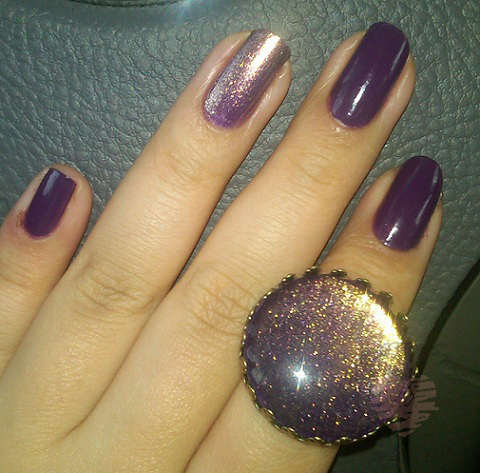 I am in love with Julia which is a beautiful purple/gold shimmery polish. The camera really didn't do it the justice it deserves. You have to see it in person to love it as much as I do. 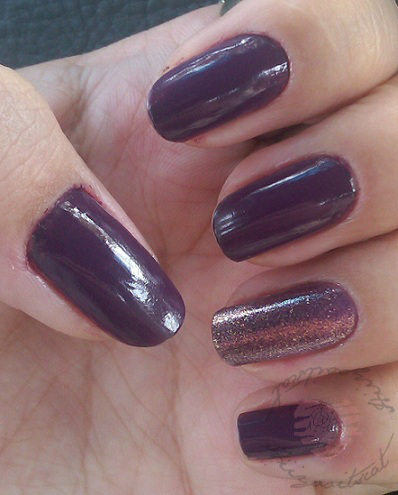 I absolutely love this deep purple plum color by julep in Gayle. 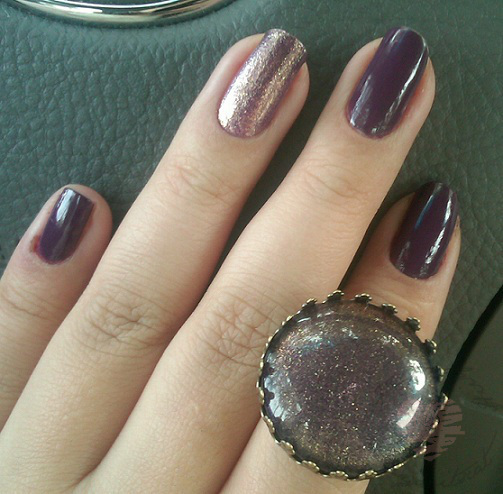 It is one of the perfect fall purple polishes and goes really well with Julia. I have been wearing this combo for about 2 weeks now (touching up the polish of course) I kept the ring simple and did it over without the heart. The shimmer peaking through is perfect and so pretty, I got a lot of compliments on the color. If you are still not a Julep Maven and are interested I do have a promo code for you to use to receive you first (Introductory) box for a PENNY! "please use my referral link "http://www.julep.com/rewardsref/index/refer/id/12436/" and use the code "MAVENINTRO" or "COLOR2012" or "PENNY2012" at checkout. Yes, I said a PENNY! For the box and the shipping all for a single PENNY!!" What did you think of the December colors? and what do you think about Julep?! I love all the promos and deals they have for the holidays! Great deals! ♥ Disclaimer: The December box was purchased with my own funds and points. Gayle was provided for review purposes. Wow!!! I think you have got great product here. What caught my attention was the nail polishes. Since I love purples, I find them so pretty. I'll check on these polishes. The Nail Polishes are Gorgeous! The ring looks great! I have yet to paint mine. ooh! be sure to share when you do! I have seen some awesome rings with nail art on them.